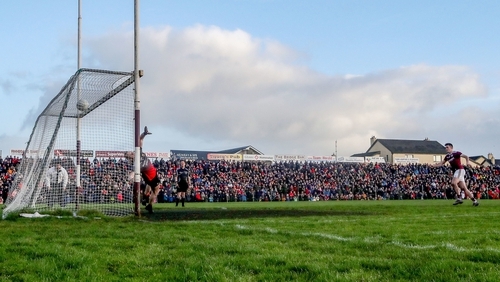 Galway advanced to the FBD League final after a dramatic penalty shootout at Tuam Stadium. A late goal from Barry McHugh forced the shootout and Galway advanced when Liam Silke, Johnny Heaney, McHugh and Tom Flynn found the net after their goalkeeper Maghnus Breathnach saved efforts from Diarmuid O’Connor and Andy Moran, with Brian Reape and James Kelly converting their kicks. Mayo led by 1-05 to 0-03 at the break, with Jason Doherty getting the goal five minutes from the interval after a long ball by Michael Plunkett. Mayo then looked set for their first win over Galway since 2015 but they got caught at the death when McHugh collected a delivery from Michael Daly and drilled the ball to the net. Mayo started the better with the win and opened up a 0-04 to 0-00 lead with Doherty getting a couple of frees and newcomer Conor Diskin scoring from a mark. Reape, impressive in the win over Leitrim last weekend, landed two good points in the opening half as the Bohola Moy Davitts clubman caused the home defence plenty of trouble. Galway’s failure to deal with a long ball from centre-back Plunkett led to Doherty firing to the net from close range five minutes from the break. McHugh reduced the margin just before the interval when he kicked his second free of the contest to leave them five points adrift at the break. Andy Moran came on at half-time to get his 16th season up and running for Mayo. Doherty and McHugh twice exchanged points early in the second-half to leave it 1-07 to 0-05 after 46 minutes. Galway got the gap down to 1-08 to 0-08 after 58 minutes after Johnny Heaney had hit the post with when McHugh pointed a 45 but almost immediately Reape hit back with his third point of the afternoon. Galway squandered a few goal chances after that but McHugh saved them in the dying moments when he drilled the ball to the net after a long delivery from Michael Daly to force the penalty shootout. Last weekend Mayo survived a similar shootout against Leitrim but Galway goalkeeper was the hero this time when he saved two kicks. Galway: Manus Breathnach; Declan Kyne, Sean Andy Ó Ceallaigh, Liam Silke; Kieran Molloy, John Daly (0-02, 0-01f), Dylan Wall; Kieran Duggan, Tomas Flynn; Cillian McDaid, Michael Farragher, Johnny Heaney; Frankie Burke, Michael Boyle, Barry McHugh (1-06, 0-04f, 0-01 ’45). Subs used: Peter Cooke for Duggan (35), Seán Kelly (Maigh Cuilinn) for Molloy (42), Michael Daly (0-01) for Farragher (50), Gary O’Donnell for Wall (52), Eoghan Kerin for J Daly (61). Mayo: Rob Hennelly; Keith Higgins, Brendan Harrison, David Drake; Colm Boyle, Michael Plunkett, James McCormack; Donal Vaughan, Diarmuid O’Connor; Fionn McDonagh, Conor Loftus, Fergal Boland; Connor Diskin (0-02, 0-01f), Brian Reape (0-03), Jason Doherty (1-04, 0-04f). Subs used: Andy Moran for Loftus (35), Conor O’Shea for Boland (48), Stephen Coen for McCormack (53), Lee Keegan for Doherty (64), James Kelly for Drake (72).